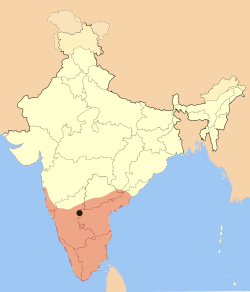 The Vijayanagara Empire (an aa cried Karnata Empire, an the Kinrick o Bisnegar bi the Portuguese) wis based in the Deccan Plateau region in Sooth Indie. It wis established in 1336 bi Harihara I an his brither Bukka Raya I o Sangama Dynasty. The empire rose tae prominence as a culmination o attempts bi the sootrhen pouers tae waird off Islamic invasions bi the end o the 13t century. It lastit till 1646, awtho its pouer declined efter a major militar defeat in 1565 bi the Deccan sultanates. This page wis last eeditit on 3 Apryle 2017, at 01:52.